An 18 year old female out walking with fellow students trip and suffered a possible fractured ankle and slight concussion. As it was our training night, a groups of people were already at base and 2 vehicles departed within 15 minutes of the callout. 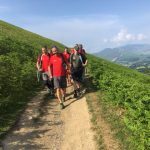 She was quickly located and given analgesia and her ankle splinted and then stretchered down to the Rosthwaite to meet up with the group’s minibus which transported her to Carlisle Infirmary.